After all the news that came out from Friday through Sunday, the actual announcement of XCOR’s deal with the Midland Development Corporation (MDC) to locate its headquarters and R&D center in the West Texas city was something of an anticlimax. Most of the details of the deal were already released; during a half-hour teleconference with reporters monday afternoon, XCOR officials sometimes referred to those accounts, like one Sunday in the local newspaper, the Midland Reporter-Telegram, when asked for details about the incentives MDC is providing XCOR. 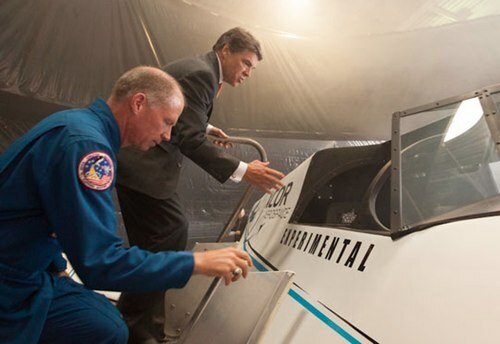 Earlier in the day, XCOr did get an endorsement from Texas Gov. Rick Perry, who appeared at a separate news conference for local media in Midland. “We couldn’t be happier to welcome XCOR to the Lone Star State, and we couldn’t be prouder to be home to their new Research and Development center,” he said in prepared remarks, most of which focused on more general business and employment issues, as he played up how business-friendly the state is. “When we were looking at the right fit for our community, taking a chance with bringing in the first large company in our target industry, the fact that they were a leader in this new type of industry, the fact that they had an established business plan,” sad MDC chairman Laura Romans. Greason and Andrew Nelson, XCOR’s COO, emphasized that this was an expansion, not a move, and that they would maintain an operations base in Mojave, where they’re currently developing the prototype Mark 1 version of their Lynx suborbital spaceplane. That work will continue in Mojave as Midland renovates the hangar that XCOR will lease there and while the airport gets an FAA spaceport license, a process they expect to take up to 18 months. Mojave will also be a base for operational flights. Nelson said that if they later get a “wet lease” customer for the Lynx flying out of Mojave, “we’d be open to that wet lease customer assuming that operation” from XCOR itself. Development of later versions of the Lynx, though, will take place in Midland. Greason said flight tests of the Mark 2 version of the Lynx, capable of going to 100 kilometers, will take place in Midland. The company is also planning a Mark 3 version for nanosatellite launches and even an orbital system that will start “ramping up” in a few years, Nelson said. “We see over a hundred employees over the next four to five years” in Midland, he said. And that’s music to Midland’s ears.